In partnership with the University of West Florida (UWF), our Seamanship advanced grade course has been made available to those mariners needing an alternative method of effective boating education. Seamanship Online is a narrated version of the classroom course with student manual and handouts. Self-study chapter questions are completed and corrected online for immediate feedback. The course exam is also online to allow course completion without waiting for printing and mailing of a course exam. What is needed and what is the process for this new development? First, you need a computer and reliable internet service (preferably DSL or high speed cable). The narrated Microsoft Power Point© imagery has been modified by UWF to make it more easily downloaded and viewed. Second, a little patience will be needed because the course material will be mailed from USPS Headquarters after they get the enrollment verification. After receiving the course material, your determination and study habits will determine the time necessary to complete the course. Third, your e-mailed questions will take a little time for responses since the instructor will be available but not necessarily online when you are. Fourth, testing online is controlled and time limited so that once started, the test must be completed. Students who have been in formal education programs in recent years will find testing easy—a few students may find the process challenging and need to use the self-study quizzes for practice. Fifth, again a little more patience will be needed. On successful completion of the Seamanship Online course, a completion certificate will be sent by USPS Headquarters. This is an easy process that will allow the USPS Educational Department to better serve everyone in a new format regardless of location and class size limitations. To enroll, click here or on the UWF image above to link to the University of West Florida. The UWF Continuing Education web site will open. Select the course in which you are interested, click "Add to Cart" for that course, and follow the instructions to enroll as a Continuing Education Student with the university. Pay the course fee with a credit card. It may take a day or two for the credit card purchase to be bank validated and for UWF to notify USPS that a new student has enrolled. After validation, USPS Headquarters will mail you your course material. Upon validation, the course online material is activated and off you go for the online learning adventure. It is very important to follow the instructions since online course questions can not be answered by USPS Headquarters staff. Technical questions are answered by UWF Information Technology personnel and course material questions by the USPS Boat Handling Committee. Why Seamanship online? Simply it is time for us to increasingly serve mariners with technology capabilities fitting 21st century education models. We can also provide advanced courses to mariners where squadrons have too few students ready to form a regular classroom group. Online education is a developing educational venue we need to explore and use! 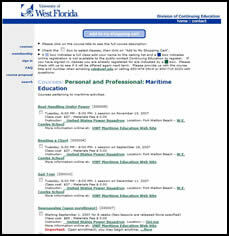 Click on the UWF Maritime web page. The UWF Continuing Education web page opens up. Select "USPS Seamanship Online (open enrollment)" for the month in which you are interested, and then click the "Add to Cart" button next to the course in which you are interested. After clicking on the "Create New Student Profile" button, enter student enrollment information and follow the subsequent instructions. On acceptance of registration, your instructions will be sent by e-mail. Course material should be received from USPS Headquarters shortly. Follow the UWF course instructions to complete the course. Enrollment authorization will be verified by USPS Headquarters. Payment will be verified by the credit card company. USPS Headquarters will be notified to mail the course materials and the Boat Handling Committee will be notified that you are a student. The Boat Handling Committee will monitor your progress. Direct any questions as instructed on the web pages. Enrollment and technical questions go to the UWF. Course instruction materials questions go to the Boat Handling Committee. You will receive a welcome letter, an instruction letter and a syllabus. Please read them carefully. Seamanship will be managed within UWF Distance 2 Learn (D2L). There will be eight sessions (chapters) with each session lasting one week. The course will remain open for 15 weeks in case a student needs additional time. There will be written and online instructions with a schedule of session activation times. Each session will have a Microsoft Power Point© presentation with narration and study questions. A headset may be desirable for listening to the narration. Study questions will be available at the end of each session. These review questions are time controlled but there is more than adequate time to complete them. Questions will be corrected immediately and available for review. UWF Information Technology personnel will provide technical assistance for the online course. The USPS Boat Handling Committee will provide course content assistance. When the course material is finished, an online end-of-course exam will be made available. Following successful exam completion, USPS Headquarters will issue you your course completion certificate. If a retest is necessary, you will be directed to contact the Boat Handling Committee Chairman for instructions. General questions about Seamanship Online should be directed to the Boat Handling Committee.